Excerpt of original article by Kathy Gearing which appeared in the Spring 2006 Newsletter. Photograph: provided by Lee Moynes and taken by his friend Joan. This photograph was taken on a wet, drizzly day on Dartmoor on the 14th June 2002. The photographer had been sitting in the car watching the ponies with her partner and decided to take a picture of them before they went home. They were totally baffled when they saw the little girl who appears to be petting the pony, as they are absolutely sure there was nobody else around at the time. Joan says, "the little girl was not wearing appropriate clothing for that cold, wet day and she was "brighter" than she would have been in the flesh - so to speak". 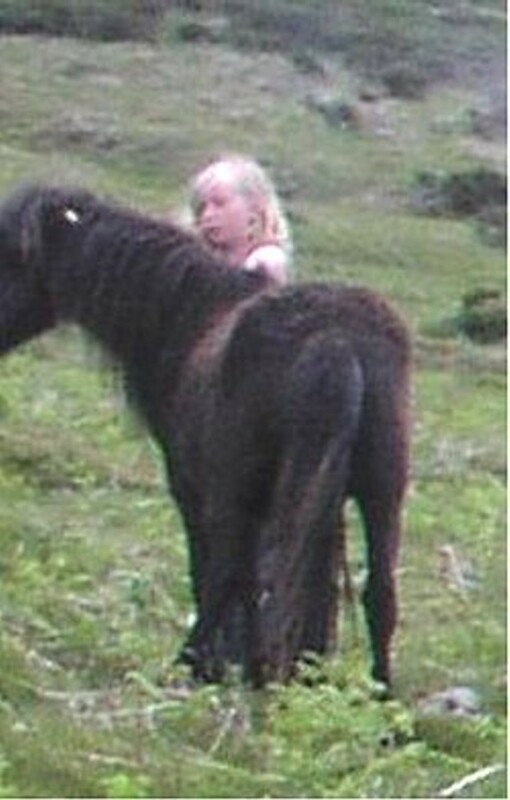 It does seem very unlikely that a young girl would be out on Dartmoor, miles from anywhere on her own. Joan adds, "also those ponies do not stand still to let anyone touch them. The only person we saw, apart from the cars which drove by, was a man driving a tractor coming off the moor to get on to the road".